Old School Racer is best described as Trials HD Lite. You guide a motorbike across a 2D course designed to provide some challenge in getting to the finish line. In order to overcome those challenges, you need to get used to both the course and the specific physics rules of the game. Essentially, a platformer with a bike. The least impressive aspect of OSR is its presentation. It's not horrible by any means, but aside from the few frames of animation the rider has the entire game looks like a collection of clipart either being slid around or rotated when necessary. It gets the job done and, really, is better than half of what you'll see on XBLIG, but it screams "2001 web browser game" like no other. The sound is in the same ballpark, with mediocre (but thankfully not annoying) music and some unfortunate effects. The revving and turbo get obnoxiously loud at times and occasionally upon completing a course the engine revving will continue like it's stuck for a few seconds. Getting all that unpleasantness out of the way, the controls are executed pretty well. Much like Trials HD, you have your gas, your brake, and your forward and back leaning, though not with as much precision and control as its XBLA counterpart. That isn't to say the game doesn't control well. It's more of a comment on the game being more simple than the physics-bending controller-throwing nigh impossible ideas of the later courses in Trials. In OSR, your most difficult task is usually going up a 90 degree wall off of a jump, which is easier than it sounds in this game, or balancing on top of a ball. To make the game a little more interesting, all bikes beyond the initial one have a turbo button that, if used too much, overheats the bike and makes it explode. Think Excitebike with a larger BOOM. Overall, I don't think there was any time in the game I felt like the controls weren't allowing me to do what I needed to do. One downside is the turbo. Unless I'm mistaken, I think it actually started a few times on its own. It's a seriously weird glitch that I didn't know how to repeat with consistency, but one I'm pretty sure is there. Where Old School Racer shines is in how much stuff it gives you to do. Twenty courses and four mini-games, each with its own individual high score board and winnable medals of the three primary award metals, provide a good amount of bang for your four digital quarters. In addition, there are a lot of bikes to unlock, and to do so you need to find golden tickets in each level, giving you plenty of incentive for replay. On the downside, this is also where the game shows us the limitations of XBLIG. Leaderboards are local only and there aren't any achievements, so a lot of the replay value that might be on a similar game on XBLA isn't able to shine here. Overall, Old School Racer will provide at least an hour of fun for your buck, and perfectionists will get a lot more than that. I personally thought it was a fun diversion, but the lack of online leaderboards or something else to shoot for really does take a lot out of my desire to play further. 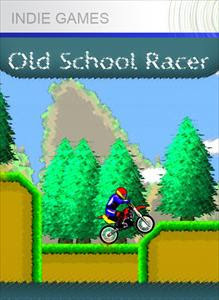 Old School Racer from Riddlersoft is available on XBox Live for 80 MS Points. Completed each course and each mini-game, went back for medals and tickets on the first ten courses, and was confused by the loading screens asking me to go to a website for more information when the website isn't up. Just thought i'd point out one thing. It does have online leaderboards. It seems to trade scores with anyone on at the same time as you. There is always someone on when i'm on so im surprised its never sync'd on your copy. I have over 50 scores on each level to beat.